SONGS FOR SOUND - Helping people Hear Again! Songs for Sound is a 501c3 charity founded on a heartwarming story and a passionate objective: to provide AWARENESS OF hearing loss solutions, ACCESS TO hearing loss testing and devices and encourage ACTION for those suffering from hearing loss and deafness. Songs for Sound aims to provide everyone with an opportunity to live a mainstream life full of sound and language, and of course, MUSIC. The story culminated with 14 month old Lexi’s deafness was missed after her parents repeatedly begged for answers. Now 10 years old, Lexi’s life is representative of a life lived to the fullest. Missed lullabies were the saddest part of Jaime’s realization for what Lexi should have been able to hear. Because of her story, the Vernon family was heartbroken that so many go without the knowledge of something as simple as getting help for hearing loss. Jaime Vernon, Lexi’s mom, quickly realized everyone should have the right to HEAR EVERYTHING, including the beautiful sounds of MUSIC. Now, that mission has turned into a national tour with a free hearing screening clinic called the Hear the Music Project, amongst many other programs including mission work overseas, veterans programs and an annual Hear the Music Kids Camp. SO WHY DID YOU CHOOSE BIZBOX? After repeated attempts collecting bids and quotes from many experiential marketing companies, we continually ran into the issue of everyone offering a unit out of our already tight budget. As a charity, we have to watch how much we spend on equipment, so we are also managing best practices; Not to mention, our tight charity budget. I became so frustrated and finally began to search for options to do this myself. I found nothing too appealing until I ran across this amazing unit called a “BizBox” Unit! It was unlike anything I had found. Customizable, roomy, sleek & affordable! It was not only priced within our charity’s budget, but BizBox worked with us to make quarterly payments to help us maintain a healthy cash flow. I could not be more grateful to the Charles Sidi and Team BizBox! HOW ARE YOU USING THE BIZBOX? It is designed to accomplish the following: AWARENESS…ACCESS…(encourage) ACTION. We screen fo hearing loss and refer to local Audiologists, ENTs and more. HOW HAS THE BIZBOX BENEFITED THE COMPANY AND ITS MARKETING OBJECTIVES? We turned our BizBox into a mission mobile. Not only do we offer state-of-the art screening technology, but we have multiple kiosks for guests to peruse hearing technology and clinic finders, take away more info. We are able to create additional dialogue simple because the unit is so inviting. The artwork elements we added make everyone feel so welcome. WHAT HAS BEEN THE ROI FOR YOU WITH BIZBOX? To date, we’ve provided over 17,000 free hearing screenings in less than 2.5 years! Our goal is to have two units God-willing with donations and support from sponsors, grantmakers. Our external wrap is also a huge benefit. To date, after our mission has been featured on Fox & Friends, USA Today and more, we’ve reached over 150 MILLION brand impressions! That means AWARENESS and we are helping people HEAR! It’s so successful, we’re launching a partners and affiliates program for local Audiologists, state health programs, charities and businesses to offer this same service. There is a BizBox for every dream to help communities hear again! Desus & Mero’s 5-Borough NYC Tour. The Pop-Up Agency rented a BizBox EP for Desus & Mero's 5-Borough NYC tour and the tour was such as success they extended their rental to tour additional cities. We chose BizBox because it was the perfect solution to create a mobile pop-up experience for Desus & Mero’s 5-Borough NYC Tour. The comedians played 5 live shows in each borough of New York, and we turned the BizBox into a typical Bronx Themed Bodega to offer an additional fan & retail experience prior to the show. We’re using the BizBox as a pop-up retail store. Since Desus & Mero have the nickname “The Bodega Boys” we turned the BizBox into a customized merchandised deli, with limited edition products and some of the comedian’s favorite snacks. 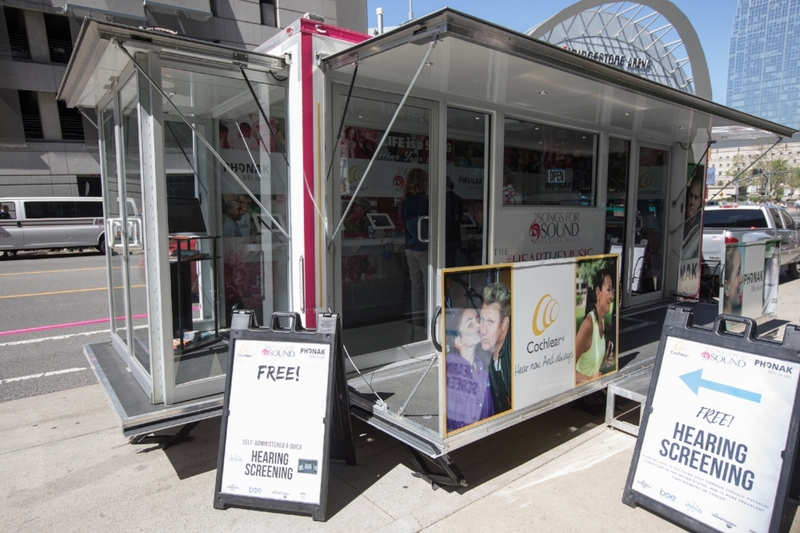 The BizBox helped to prove out the viability of mobile pop-up campaigns. While we’ve excelled at multi-city brick and mortar executions, this is the first time we had a consistent experience to bring to fans in different locations. The ROI has been tremendous – not only from a sales perspective, but in creating additional case studies for our clients partners to review as we determine the best pop-up execution for their brand. Denver Elections Divisions is part of the Clerk and Recorders Office in Denver Colorado. We provide comprehensive election services for the City and County of Denver including voter records, election operations, election administration, and communications. The City and County of Denver has 410,000 registered voters and to better provide service we implemented the new BizBox platform. 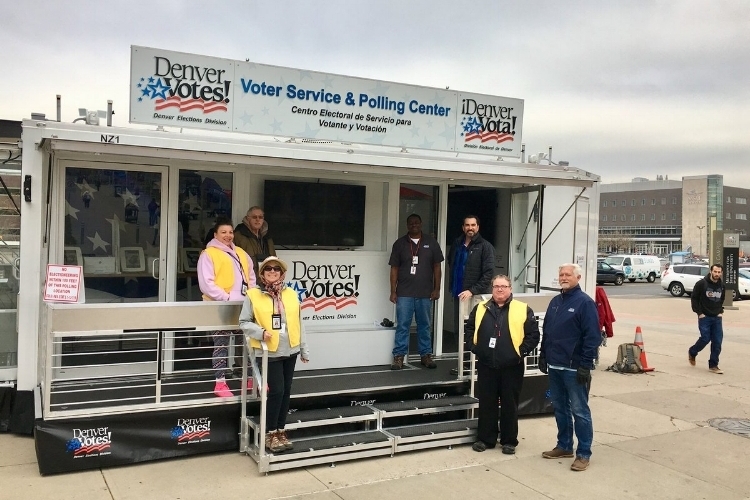 DENVER ELECTIONS DIVISION PURCHASED A BIZBOX 2.0 AND AFTER IT HAD BEEN DEPLOYED AS A VOTE/REGISTRATION CENTER TO MORE THAN 8 LOCATIONS IN 2017 AND PLANS TO DO THE SAME IN 2018, IN ADDITION TO EDUCATION AND OUTREACH EVENTS WE ASKED THEM WHAT THEY THOUGHT OF THE BIZBOX EXPERIENCE. The BizBox has unique capabilities and an eye-catching design. The build quality of the trailer was made with high quality components and building materials. We believe this allows for a good return on investment as we plan to get many years of use out of the trailer. We found the design of the trailer allowed us to be flexible for our many different events and needs. Because of its mobility it has proven to be an asset to complement our election processes and enhance our visibility in the community. Working with a local vendor, we had the BizBox custom outfitted to meet our unique election needs. We have a dedicated staff of 8 to 10 election workers that form a team to setup the BizBox, run an event and breakdown the trailer. How are your using the BizBox? We use the BizBox for educational purposes, as a mobile voter service and polling center, and voter registration. We have taken it to school campuses where students participated in mock voting and gave us positive feedback. Due to the unique qualities of the BizBox and our aftermarket customization of the trailer it has great visibility and has proven to be an effective marketing tool. When at large events it draws attention quickly and people are interested to see what it is about and how it works. Since our BizBox, nicknamed Haul–N-Votes made its maiden voyage at National Voter Registration Day 2017 in Denver Civic Center Park word is starting to get around. In addition to some of the events mentioned above, we plan a much more extensive, schedule-based deployment plan in 2018. Our big ROI is that the BizBox gives us another way to meet voters where they are. Masonite International Corporation is a leading global designer and manufacturer of interior and exterior doors for the residential new construction; the residential repair, renovation and remodeling; and the non-residential building construction markets. 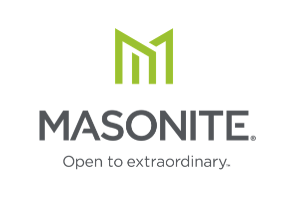 Since 1925, Masonite has provided its customers with innovative products and superior service at compelling values. Additional information about Masonite can be found at www.masonite.com. MASONITE PURCHASED A BIZBOX 2.0 AND DURING THEIR SUCCESSFUL TOUR CALLED TRENDLIVE WE ASKED THEM WHAT THEY THOUGHT OF THEIR BIZBOX, ESPECIALLY AS THEY HAD JUST RUNG THE CLOSING BELL AT THE NYSE! We chose BizBox because of the way it looked! We loved the windows & doors - when it was set up, there was an inviting quality that we thought mimicked our brand. It didn’t look like a regular box truck and it draws a lot of positive attention. How you are using the BizBox? Masonite envisioned a traveling showroom to be able to take our trend message out to our customers. The BizBox trailer allows us to communicate, educate and show our doors to multiple dealers, distributors, retailer and builders all across the country. One of our brand pillars is to change the conversation around doors. Even though we use doors constantly throughout the day, people tend not to think of them as a design element in the home. With the BizBox trailer, we wanted to show how interior and exterior doors can change the look and style of your home. The name of our tour is TrendLIVE, and the trailer really has brought trend to life! It’s expensive to own a static showroom and limiting to only have one area in which to showcase product. With BizBox, we not only hit multiple areas and customers, but also attend trade shows. Having that versatility is key to a positive ROI. Twin Lakes is a progressive telecommunications provider and has been a leader in technology for over 65 years. Twin Lakes serves more than fifteen exchanges with over 30,000 access lines offering a full range of broadband (with speeds up to 1 Gig), IPTV, telephone and security services. Today Twin Lakes’ fiber network connects homes, businesses, and communities with the power to change lives, drive economic development, improve education, healthcare and so much more in rural America. TWIN LAKES PURCHASED THEIR BIZBOX EP LAST FALL AND AFTER THEY HAD TIME TO ACTIVATE THEIR BIZBOX WE ASKED THEM WHAT THEY THOUGHT. We loved the flexibility BizBox offered. We were looking for something that easily made an impression while also being relatively easy to setup and take down. 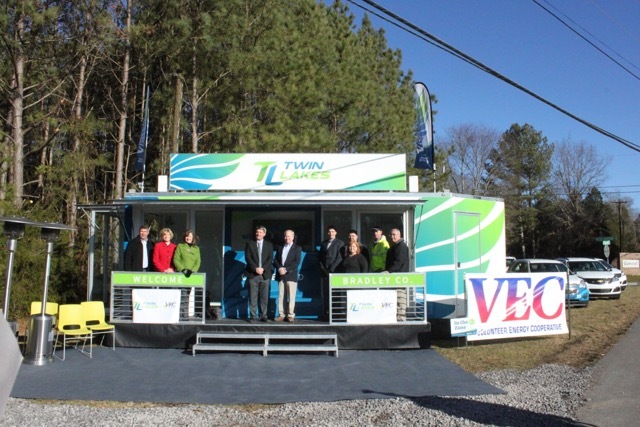 Twin Lakes is using our BizBox to strengthen our presence and brand identity while educating our customers on the benefits of a fiber network in the communities we serve. We have included many of the innovative technologies we currently offer such as SmartHome Automation, Wi-Fi Access Points, Gigabit Internet Speeds, and Surveillance Cameras. The Bizbox has provided Twin Lakes a powerful opportunity to create experiences and interact with our potential consumers, leaving a lasting impression. Due to mobility, the options are endless and we can reach out to our consumers wherever they may be. To date, the BizBox has served as a mobile office that has allowed Twin Lakes to have a physical presence without having a physical office in a new service territory. The mobile unit will provide greater brand visibility and maximum exposure for Twin Lakes when utilized at our annual meetings, tradeshows, schools, legislative events, local street fairs, etc… Additionally, the trailer raises awareness while on the go, to and from events, it serves a mobile billboard. ROI means different things for different people. For us, we were looking to generate a buzz and create lasting impressions. With the BizBox, we have accomplished that. Additionally, we were able to create some additional revenue ahead of schedule. We had intended to set the trailer up for a mobile office in a new territory but before we could fully get it setup, it had already created a buzz. People, and what turned out to be potential customers, were stopping in just to see what the trailer was; we were able to sign them up for service that night.